Thomas Hollis (1720-1774) came from a wealthy English family who spent much of his time promoting the cause of liberty in England, Europe, and the American colonies. He was most influenced by the theorists and politicians of the English Revolution in the mid- and late-17th century, such as John Milton, John Locke, Algernon Sidney, Andrew Marvell, and Edmund Ludlow. He reprinted their works in the 1750s and 1760s and distributed them to libraries across Europe and the Americas, especially the library of Harvard University with which his family had had a long relationship. Hollis' edition of John Locke's Two Treasises of Government (1764) was widely distributed and read in the American colonies and is regarded as an important mechanism for the transmission of Lockean ideas before the American Revolution. The special twist Hollis gave to his book publishing venture was to make beautifully bound volumes which included expensive and subtle design work (such as embossed emblems of Phrygian or "liberty" caps and daggers representing Brutus's assassination of the tyrant Julius Caesar). He also had elaborate frontispieces made to his specific design. Some of these were turned into "postcards" which he distributed separately in order to promote these ideas of republican and individual liberty. We include a couple of them here. The etching on the left was drawn by Hollis's regular artist Giovanni Battista Cipriani and probably engraved by James Besire. It shows a monument or obelisk to Hollis dated 1767 with several of his favourite symbols. In the background we can see clouds and possibly rain over a valley with a river. On the front face of the pyramid structure we can see the owl of wisdom and peace holding a palm branch with its wings outstretched; beneath this is the head of Hollis shown in the Roman style thus suggestiing a connection to Brutus; below his head are two daggers on either side of a cap of liberty. On the right face of the pyramid there is an oak leaf branch. 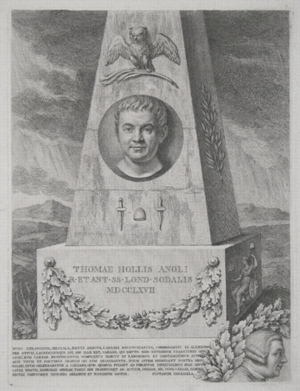 On the square base we can see an engraving in Latin we says "Thomae Hollis Angli R. Et Ant. SS. Lond. Sodalis MDCCLXVII" (Thomas Hollis, Fellow of the Royal Society, Member of the Society of Antiquaries 1767) and an oak leaf decoration. On the right face of the base we can see Britannia seated in her chariot holding a trident and a staff with possibly another phrygian cap on the top. In the lower section of the print is a lengthy Latin quotation from Plutarch's Parallel Lives ("Marcus Brutus") with a statement which probably sums up Hollis's opinion of himself “You have always found me on the best and justest side". Next to the quotation is another oak leaf branch and the head of Hollis facing right dressed as an 18th century gentleman. There are two laurel branches tied at the top not the bottom, with a single stem at each end and a neatly tied ribbon in bow. There is a phrygian cap and a bar below the wreath. The long haired Sidney (spelled "Sydney" here) carries a banner over his shoulder which reads "Sanctus amor patriae dat. animum" ("The sacred love of the fatherland inspires") . 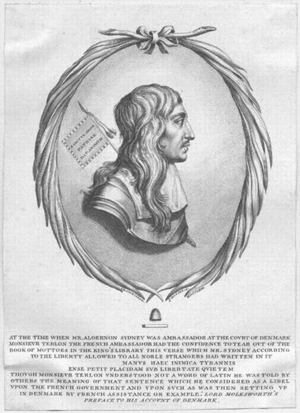 The text reads: Algernon Sydney second son of Robert Earl of Leicester. Colonel of a regiment of horse. One of the Council of State and Commissioner to mediate a peace between Sweden and Denmark. 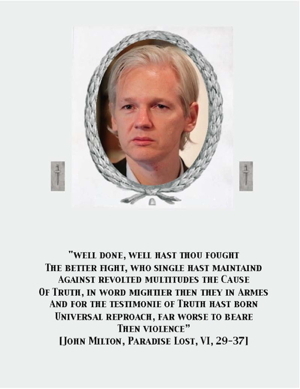 Beheaded afterwards unjustly for high treason Dec. VII MDCLXXXIII. Drawn and etched MDCCLX by I.B. Cipriani a Florentine from a proof impression of a seal ingraved by Thomas Simon in the possession of Thomas Hollis of Lincoln's Inn F.R. and A. SS. The time when Mr. Algernon Sidney was ambassador at the court of Denmark Monsieur Terlon the French ambassador had the confidence to tear out of the book of mottoes in the king's library this verse which Mr. Sydney according to the liberty allowed to all noble strangers had written in it "manus haec inimica tyrannis, ense petit placidam sub libertate quietem". Though Monsieur Terlon understood not a word of Latin he was told by others the meaning of that sentence which he considered as a libel upon the French government and upon such as was then setting up in Denmarck by French assistance or example. [Lord Molesworth's preface to his account of Denmark]. Col. Sydney bore this only motto without figure on the parliament side during the civil wars. Note: Translation "this hand, hostile to tyrants, seeks with the sword a quiet peace under liberty". The motto was adopted by the State of Massachussetts as its official motto. The anecdote comes from Molesworth's An Account of Denmark, as it was in the Year 1692. The Third Edition Corrected. (London: Timothy Goodwin, 1694). Preface, pp. xxxiv-xxxv. One of the Hollis' most revered 17th century writers was the poet and revolutionary politician John Milton. 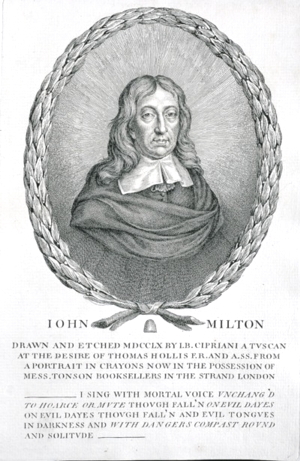 Hollis not only assisted in the publication of Milton's works but also had at least four different illustrations of Milton made (more than any other figure). He created one of the yound boy Milton, Milton as a young man, Milton as a mature poet and politician, and the blind old man Milton. Here we have an illustration of the mature but not yet blind poet. The laurel wreath is not made up of two parts but appears to be one piece; there is one stem at each end and the ribbon is tightly tucked up; there is a phrygian cap but no bar. Text states: Iohn Milton. Drawn and etched MDCCLX by I.B. Cipriani a Tuscan at the desire of Thomas Hollis F.R. and A.SS. from a portrait in crayons now in the possession of Mess. Tonson Booksellers in the Strand London. Urania, and fit audience find, though few. It seems that, like Milton, Hollis thought his voice for liberty was calling out alone in the darkness and the solitude of the 1760s.